I opted to refresh myself before checking on Don and the Basque. My cabin door was unlocked and partially open. I did not even gripe out of disgust for the violation. Somehow, my space, and in fact, my very person, had become part of the ship’s public domain, just like the Rest Rooms. There was no point in further complaints. Seemingly, my stock had sunk to new lows as my adventure was nearing its finish line. I could not help feeling that, despite the mission’s success to this point, I was about to lose something of great worth. Once inside the cabin I assembled my Sitka outfit. I emptied my pockets of the suppressor and the Kel-tec, concealing them under my pillow. I curled up the two remaining Krueggerrand belts and tucked them into pockets located on the back of my new vest. I distributed the bulky currency in every available pocket. It gave the vest heft, but did not tip off anyone that I was carrying a lot of money. I re-discovered the small radio, once again. I wondered if it still worked, but didn’t try it. I stuck it in my back pocket. I could toss it later. I stripped off the remainder of my clothes, went into the bathroom and turned on the shower’s hot water tap. I waited by the shower stall, naked, and deep in thought. Then I retreated back into the main cabin, and pushed down the ‘play’ button on Hathoot’s CD player. Nothing came out. I climbed under the steaming hot water, and closed the glass door. From under the cascading waterfall I heard music, but I could not quite make it out. I twisted the handles to “off,” and stood inside the stall dripping. “...Just call me Angel of the Morning, Angel…just touch my cheek before you leave me… baby… just call me Angel of the Morning… Angel…then slowly turn away from me….” I reversed the water handles to full “on,” in order to drown out any more words. A chill passed through me that I could not shake, no matter how hot I made the water. Marlys had requested my presence in her quarters. What could possibly be more important than that, I concluded. My personal life consisted entirely of waiting for the next mission, or being on that mission. I certainly had no ‘Marlys,’ or anybody vaguely like her, waiting for me in the real world. All I had was the Agency. I did not like the CIA, and the Agency did not like me. However, they had plenty of agents, while I had only one Agency. I was fast running out of time to build a domestic life for myself. My mission aboard the Lindy had driven that vital truth straight home, to the forefront of my consciousness. I had to keep my meeting with Marlys, above all else. I reached for a towel, staring at the rack. I had made certain a dry towel was on the rack before I had gotten in the shower. I stuck my head around the bathroom door jam. My cabin was filled with people. Agent Maxwell threw me my towel, with a wickedly nasty look on his face. Upon completing his short salacious speech, Maxwell held out two objects I had not noticed him clutching. I now recognized the suppressor and the automatic. “Apparently, there is a request for extradition, issued by the Russians, for somebody who shot a bunch of people with a small caliber hand weapon.” Maxwell’s grin was one of supremely twisted and bitter happiness, although I noted, with small satisfaction, that he still spoke too loudly. His ears had not yet recovered from the dust-off. Borman and Günter flanked him. Neither German had a facial expression. I could not tell where they stood, with respect to the fact that Maxwell was obviously placing me under arrest. The last strains of Angel of the Morning were blaring from the CD player. Maxwell hit the “off” button. I dried, wondering if that song would be the last decent music I would enjoy for some time. I had heard that American federal prisons played mostly rap or hip-hop, and that prisoners watched the World Wrestling Federation on television. Neither pursuit was one that I looked forward to. I dressed rapidly, in the outfit I had prepared, being very careful to conceal the bulk of the gold and currency hidden in the pockets of my extra photographer’s vest. And Hathoot’s passport. I needed to return that to him for identification purposes. In truth, I missed my Brioni coat. Alaska was an intrinsically cold place, even in summer months, and I had no idea where I might be going. In Africa, the Agency took six months before bothering to get me out of prison. Six months inside any prison is a long time. That had been the longest, of my seven prison stays. Soon to be eight, I reflected, ruefully. I hoped that the two boys would be all right without me. Maxwell then mouthed the magic words. “Put your hands on the wall and lean against it.” He spoke them with obvious glee, pulling a set of Smith and Wesson handcuffs from a hidden belt case. “Bulkhead,” I said, not budging. The man gawked at me. “What?” he finally said, befuddled. “Bulkhead. It’s called a bulkhead on a ship, not a wall. Isn’t that so, First Mate Borman? The German Officer remained stoic, in both expression and sound. “Put your damned hands on the bulkhead, then!” commanded Maxwell. Slowly, I complied. He roughly cuffed me, as he spouted more magic words. “You have the right to remain silent…” He ran on until the entire Miranda warning was issued. When he was done, he pulled me around roughly, as if the fact that I was in handcuffs meant that I was also subject to abusive physical treatment. I did not resist. Most American law enforcement agencies had long ago come to the same conclusion. Once a prisoner was in their ‘possession,’ that prisoner was no longer truly human. He had that constantly, and consistently, made clear. The quickest and most effective way to instill and communicate dominance was through touch. The prisoner’s body was no longer private. It was the property of the arresting authority, to be prodded, pushed, probed and patted, at will or whim. “Herr Günter, it does not matter what they do or what torture they apply, I will never give up the information,” I assured the Third Mate, with intensity. Günter looked at me strangely. “Gut, that is Gut!” he blurted out. He and I both knew what I was referring to. Maxwell did not, and rushed right into my ambush. “I will never reveal to anyone that you have no balls,” I said. I had always wanted to use that great line from the movie Ghostbusters, but through all the years I had never had the opportunity, until that moment. Maxwell kneed me viciously in the groin, and I went straight to the deck in great pain. I crouched, my knees pulled up, as I tried to overcome the pain, and get my breath back. “You colossal prick!” he screamed down at me. Through my pain, I almost smiled. Maxwell was an amateur at the arresting game. My emotional ploy had caused him to forget to search me. “Nein. None of that. You do not get to hit him. Not at all,” Borman informed, grasping Maxwell by both upper arms. The German was hugely strong, and I watched, from my deck position, the Immigration Agent recoil in pain. “How come nobody ever knees James Bond, when he says something clever?” I asked, my voice still a broken whisper from the blow. Günter helped me to my feet. My wincing was worse than Maxwell’s, and I could not straighten up to walk well, not with my hands cuffed behind my back. We worked our way down the corridor. “We’re going down to the bilge deck. We’ll make the luggage room into a temporary jail until we get to Sitka,” Borman said. I halted, making both Borman and Günter stumble. I winced, when he said those words, but not from physical pain. We were so close, yet here and now the mission was again in great jeopardy. I didn’t move, even when both Borman and Günter pulled on my arms. Instead, I resisted, my legs planted onto the heaving deck. We rolled together, from one side of the narrow corridor to the other. I worked my right hand into my back pocket, as we struggled to stay upright. I pushed the transmit button on the radio, and prayed. I looked from Günter to Borman. I could tell that neither man had much enthusiasm for the work they had, probably unknowingly, taken on. “What the hell is he talking about?” Maxwell said, from behind us. I allowed myself to be slowly ushered down the corridor. By the time we neared its end I was very relieved to see Dutch, Benito, Don and the Basque standing there. I hoped, sincerely, that the Basque had brought another steak knife. Maxwell’s last sentence was a big mistake. Everyone standing in front of him visibly reacted to the agent’s weak statement of his rights. Just saying those words implied that even he did not feel he was ‘within his rights.’ Borman and Günter released my arms at the same time and stepped away. They were both distancing themselves from the whole affair, at least for the time being, but I was still cuffed, and therefore helpless. If I had known about Maxwell’s discovery of the boys, I would never have let myself be willingly cuffed in the first place. Nobody said anything, but nobody moved either. We all just stood looking at one another. Finally, I spoke. I waited for just a second to see if I was reaching the man. He didn’t interject anything, but he didn’t turn his head to look back at me either. I finished. Still nobody moved. Maxwell did not react. I watched his breathing slow, however. Then Kessler staggered into the back of the group, bumping into Don’s bad shoulder, as he reacted poorly to one of the huge swells heaving under us. Don cried out, then jerked away, but caught himself and helped the Captain stay vertical. Kessler’s finger kept pointing from person to person. He only stopped yelling because of fatigue. I was amazed, given the seriousness of his wound that he was even standing, much less speaking so forcefully and as cogently as he did. All of a sudden, everyone talked at the same time. “Quiet!” Kessler screamed, after he had recovered himself. He stood, a shoulder pressed into one bulkhead. Everyone’s balance problem was suddenly gone, I noticed, including the captain’s. We had entered the Western Channel leading into the Bay of Sitka. We were in protected shallows near the coast. Soon, we would round the spit that sticks out from the airport, built out on the peninsula beyond the village proper. We were not long from Sitka Harbor. Maxwell hesitated, and then tried to respond verbally a number of times, but quit each time before getting a word out. Finally, with bowed shoulders, he made his way back behind me, and then unlocked the handcuffs. My feeling of freedom, as each cuff came off, was pure and clean. I rubbed my wrists, even though the cuffs had never been applied with real pressure. “You haven’t heard the end of this, by a long shot,” Maxwell grumbled in my ear, before backing off. The manner in which I delivered my warning affected him. In truth, I did not know what Operations at the Agency would do, it they judged him to be counterproductive to national interests. I knew, however, what it was capable of doing. Nor did I know if my superiors would honor all of the promises I had made. I did not know what the upshot of the whole mess that had occurred at the gulag would be. I was not even sure of what really transpired myself. But I did know that a likely resolution to the whole affair would involve an after-the-fact, applied ‘justice’ that would not be understandable by anyone who had not played a role in any of it. That, after all, was what I was regularly accustomed to. “Where are the boys?” I queried Maxwell. “On the Lido deck, drinking hot chocolate. I’m not some sort of child abuser, you know,” he answered, pulling the suppressor and automatic from his pockets. He held them in his hands. I guessed that he was going to try to use them to convince Kessler of something or other, but had thought better of it. Did the man have enough mental horsepower to come to grips with what I was saying, I wondered. I pulled my Mont Blanc from one of my pockets. Without paper and leaning over to hide my movements, I tore a corner off a hundred dollar bill. I penned the appropriate Washington two-oh-two number on its edge, handing it to Maxwell. He took it, read it, and then departed without a word, taking the small scrap, and the empty armament, with him. Marlys had not come down to join the group. She probably had not been notified. There had been no time. We climbed the stairs up to the Lido deck, talking and laughing about nothing at all. When we arrived on deck, the place crawled with passengers. We walked over to the back of the deck and stood near the helicopter. Its pilot and co-pilot had abandoned their places behind the canopy, and were sitting at the bar, drinking and admiring Marlys, who was working way too hard serving everyone to notice me. Both Ivan and Kenneth were conversing with the aircrew, obviously enthralled. 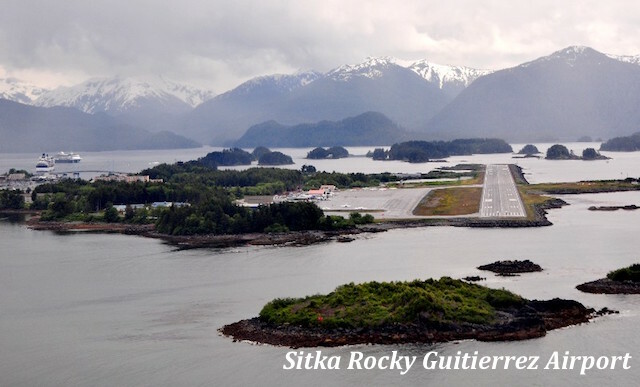 The World Discoverer passed the Sitka airport complex at good speed. We were only minutes from the main harbor. A long dock jutted toward us for almost a quarter mile. The beautiful clean town looked like it was sitting up at the base of a long extended white finger. Gray clouds scudded above a distant mountain range, and a light wind blew over the port railing. It was cool and refreshing. I inhaled deeply, at a loss as to what fate and serendipity had in store for me next.